If you are into cybergreen issues you can't call yourself informed without WORLDCHANGING. Furthermore, the people involved in this effort are the absolute salt of the earth. They're bright, fluent, capable and they genuinely get it. They don't merely "get it," they are inventing that which it is necessary to get. These are people you need to know a lot more about. 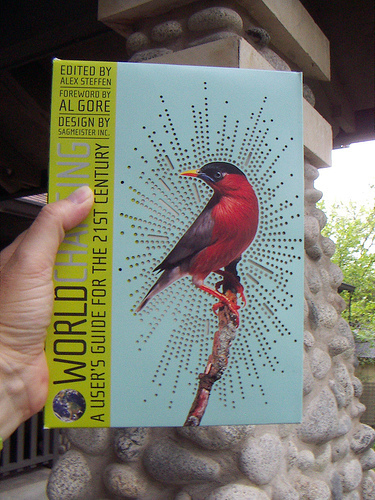 Worldchanging is poised to be the Whole Earth Catalog for this millennium. Written by leading new thinkers who believe that the means for building a better future lie all around us, Worldchanging is packed with the information, resources, reviews, and ideas that give readers the tools they need to make a difference. Brought together by Alex Steffen, co-founder of the popular and award-winning web site Worldchanging.com, this team of top-notch writers includes Cameron Sinclair, founder of Architecture for Humanity, Geekcorps founder Ethan Zuckerman, sustainable food expert Anna Lappé, and many others. Renowned designer Stefan Sagmeister brings his extraordinary talents to Worldchanging, resulting in a book that will challenge readers to personally redefine the conversation about the future.